Violet Namiluko visits a local barber shop and explains the benefits of voluntary medical male circumcision to a captive audience. Why be shy about promoting circumcision? It’s 5:00 a.m., and Violet Chizema Namiluko steps out of the house she shares with nine family members and into the commotion of George Township. 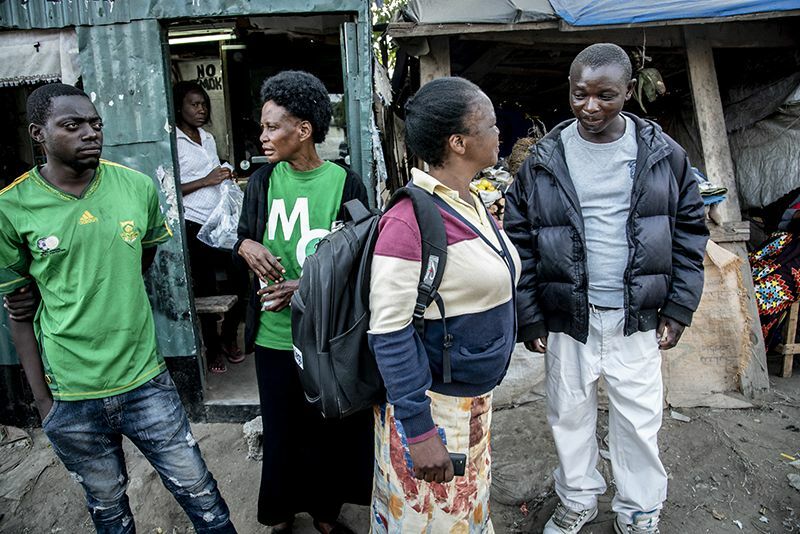 Wending her way past makeshift shops and pit latrines, she dodges blaring minibuses bound for Zambia’s capital, Lusaka city. 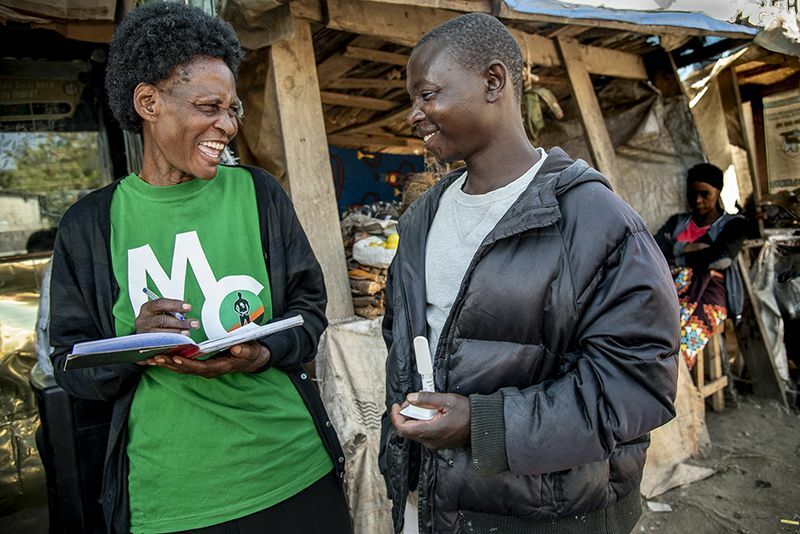 As a volunteer health promoter for the George Health Centre, Violet spends her days out and about, talking about voluntary medical male circumcision (VMMC). It’s a task that takes the 58-year-old widow into barbershops, markets, bars, clubs, churches … any place men tend to frequent or congregate. There are no “no-go areas,” Violet says, in terms of ferreting out potential clients who could benefit from VMMC. A safe, minor procedure, VMMC is part of a comprehensive HIV prevention strategy aimed at interrupting the transmission of HIV to save lives. Studies have shown that VMMC reduces female-to-male HIV transmission by approximately 70 percent. Violet talks with Friday Mutale about the HIV self-test he agrees to take, and convinces him to visit the George Health Centre for counseling and voluntary medical male circumcision. Among her health promoter colleagues, Violet is known as a “Super HP” because of her high-yielding mobilizations. “Sometimes in a month during campaign time, I bring over 200 clients,” she says. The George Health Centre—one of 90 facilities across the country supported by Jhpiego in collaboration with the government of Zambia—boasts high numbers of VMMC clients: about 600 a month, Violet says, adding that when schools are closed that number can top 1,000. 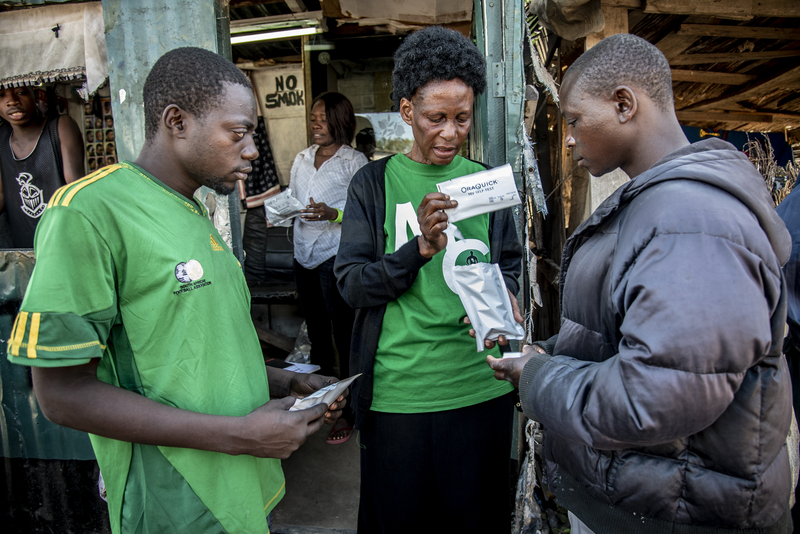 Violet assures Moses Phiri, 27, that VMMC is a safe and minor procedure that greatly reduces HIV transmission, while fellow volunteer health promoter Elizabeth Tembo talks to Friday Mutale, 40. Nationwide, 84,651 men and boys chose to undergo VMMC for HIV prevention in the past year. Funding for the program comes from the U.S. Centers for Disease Control and Prevention under the U.S. President’s Emergency Plan for AIDS Relief (PEPFAR). Violet credits Jhpiego training on skills and counseling for bolstering her ability to engage men from all walks of life. Her mission is to inform them about the benefits of VMMC, while putting to rest persistent myths and misinformation. Violet’s passion for community health, coupled with the fact that she’s lived for 40-plus years in George Township, make her a trusted confidante and a savvy source of information. In this country of more than 70 ethnic groups, male circumcision can be fraught with cultural connotations. Although some tribes have been accepting of the medical procedure, many are non-circumcising groups. 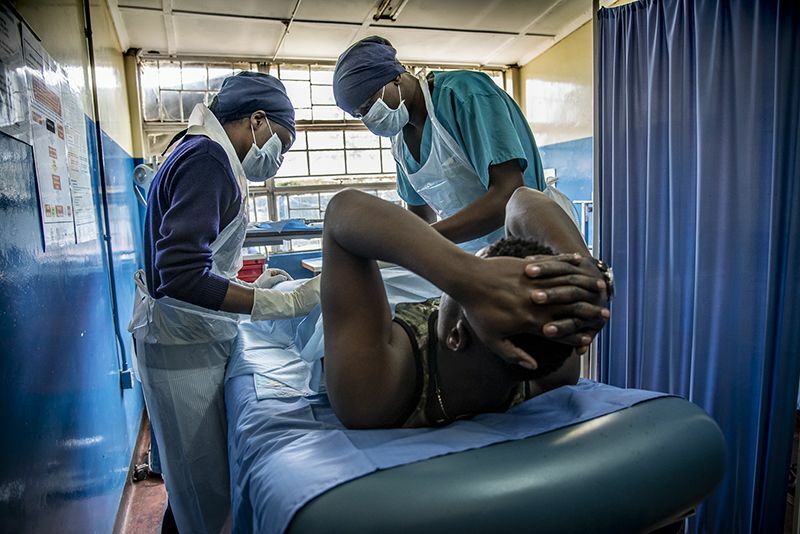 Low levels of male circumcision, along with low condom use, are prime drivers of Zambia’s high HIV prevalence rate (12.3 percent). VMMC is an essential part of the Joint United Nations Programme on HIV/AIDS strategy for ending the epidemic by 2030. Violet is especially intent on finding and following up with men like Edris Kambanji, 23, of Lilanda Township in Lusaka. 84,651 men and boys chose to undergo VMMC for HIV prevention in the past year. But then there was a second encounter with Violet. Just 2 days later, Edris made up his mind to go to the George Health Centre for VMMC. Nephas Hindamu is a Knowledge Management and Communication Specialist with Jhpiego Zambia.